Peter Pan, Tinker Bell, the Lost Boys, Captain Hook and Smee return - and you'll meet Jane, Wendy's skeptical daughter who has outgrown her mother's childhood tales of Peter Pan. Jane no longer believes in magic or fairy tales. But when Captain Hook's pirate ship swoops down upon London and carries Jane off to Never Land, her imagination is set free by Peter Pan himself! The crafty pirate sets a t… rap for Peter Pan and Tink and only Jane can help. 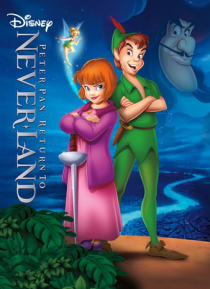 It is up to her to call upon "faith, trust, and pixie dust" to take flight to save Peter and all of Never Land.